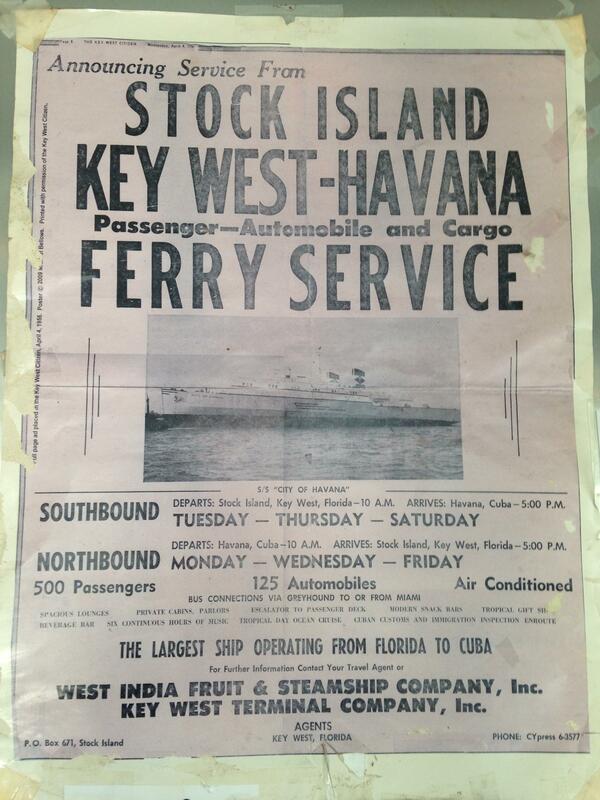 A reprinted 1956 poster for ferry service hangs in the window of the Old Town Bakery in Key West, one block from the ferry terminal. Lane's most recent visit was his first since President Obama announced in December the executive action easing some travel and trade restrictions. Lane knows, and the Obama Administration is quick to remind everyone, the trade embargo remains in place. But Lane and others say the success of the change in American policy depends upon how it's greeted in Cuba. "If they welcome foreign investment and trade and commerce, I think Cuba will be a magnet for investment," he said. "If they try to totally control it, I think it's going to stymie some of the positive impacts of the initiative." Five months into the effort to normalize relations with Cuba, the State Department has taken center stage. But beyond negotiating future embassies, the American rules of business toward Cuba are written primarily by two agencies - the Treasury Department and the Commerce Department. Those are the rule-makers for Americans traveling to Cuba, exporting to and importing from Cuba and generally wanting to do some business with Cuba. Officially, the secretaries of both Treasury and Commerce remind supporters and opponents of the re-engagement campaign that the process is still in its early stages. "We [still] have laws in place that restrict how much business can actually be done between the United States and Cuba," Treasury Secretary Jack Lew told a Miami audience in March. As for the "brand new rules," he said, "It's a little early to describe what their impact has been but it's not a full opening of normal trade relations." One of the tangible signs of the thawing of relations and potential commerce between the two nations happened in early May. The Treasury Department's Office of Foreign Assets Control approved licenses for passenger ferry service from the U.S. to Cuba. Baja Ferries U.S.A. based in Miami received its notice via email. It first applied for the license in 2005 and was rejected. This time it was approved. "It gives us the opportunity to do something we've been trying to go after for quite some time," said Joe Hinson, executive vice president of Baja Ferries U.S.A. He is now negotiating with Cuba to be able to land a passenger ferry there. If his company gets the Cuban OK, Hinson anticipates operating a 2000-passenger vessel between Miami and the Port of Havana. A round-trip, 10-hour overnight fare would run $250 plus port charges, which Hinson says are unknown "on the Cuban side." After 54 years of diplomatic and economic isolation between the two countries, it's one of the many unknowns regarding commerce by Americans with Cuba. It's easy and obvious to call the photo above historic. It was. It followed a series of milestones: Months of secret negotiations, a phone call between the two leaders, President Obama announcing efforts to restore diplomatic relations with Cuba, easing of travel restrictions by Americas, allowing U.S. credit cards to be used in Cuba, expanding the list of items that can be legally exported to the island from America and increasing remittances sent to Cuba from family in the U.S.
Cuban President Raúl Castro was the longest speaker at last weekend’s Summit of the Americas in Panama. At age 83, he was also the oldest. And that matters as the U.S. and Cuba normalize relations after a half century of cold war – a process that on Tuesday led President Obama to remove Cuba from the State Department’s list of terrorism sponsors. It matters because President Obama says his new engagement policy isn’t meant to change Cuba overnight. It’s meant to help the U.S. influence democratic change once Castro’s generation of hardline communists is gone.